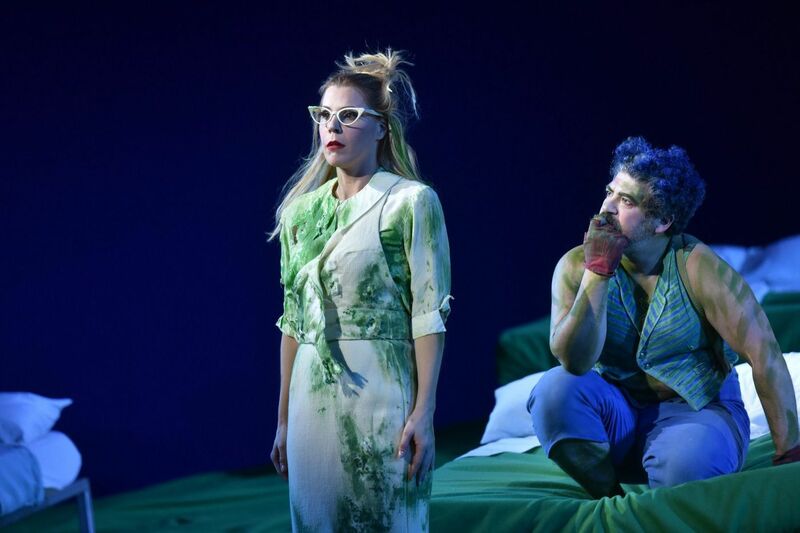 Soprano Georgia Jarman as Helena and Miltos Yerolemou as Puck in Opera Philadelphia's "A Midsummer Night's Dream." An accidental mating? A shotgun wedding that worked? With three-and-a-half centuries separating the literal extravagance of William Shakespeare and compositional elegance of Benjamin Britten, the unlikely fusion of the two in the 1960 operatic adaptation of A Midsummer Night’s Dream created something “wondrous strange” (to quote the play). But if Britten and the Bard kept a toe in reality, the Robert Carsen production presented by Opera Philadelphia on Friday at the Academy of Music created something else: a unique netherworld that, with such good vocal casting, made you want to live there. Forests had no trees in the expansive, intensely colored greens and blues of Planet Carsen, which moved ever closer to the midsummer crescent moon that lorded over Shakespeare’s classic plot about colliding forest fairies, romantic mortals on the run, and amateur actors whose egos are far greater than their talents. Dapper children had mustaches. Beds levitated. Seen for the first time in the U.S., the production and cast created one of the most alluring packages Opera Philadelphia has presented in recent seasons -- and was a rather different experience from the 2005 commercial video of Carsen’s vision. The opera itself presents challenges. Written quickly for the composer’s Aldeburgh Festival, Britten wasn’t interested in all of Shakespeare’s characters, and gives himself away in the atmospheric effects. Fairies get serpentine string wiring as delicate as cobwebs. The mortal lovers only get compositional professionalism. In much of Act I, character entrances receive no bolstering from the orchestra. This isn’t such a problem in smaller theaters in what is essentially a chamber opera. But in the second two acts, the opera penetrated well into the Academy of Music, thanks partly to music director Corrado Rovaris’ Italian opera expertise, which was filtered into concise, elegant, but well-inflected shaping of whatever the score gave him. And when the score gave him enough to work with, the whole enterprise lighted up. Also key was stage director Emmanuelle Bastet, who maintained a keen balance of physical comedy and nonphysical wit. When the audience laughs both at a character’s bad jokes -- and then at their delight in them -- smart staging has made that possible. Game of Thrones actor Miltos Yerolemou (also a seasoned classical stage actor) inhabited the key role of Puck, which doesn’t require singing but pretty much everything else. The central concept was that of an overgrown kid, and Yerolemou spent most of the role in theatrical overdrive, sometimes a tad too taken with his own cuteness. But he created a highly effective pathway between the opera and the audience. Even for those who know the piece, it’s a world that initially requires some gentle indoctrination. Other cast members have worked in the early-music community, in which small musical gestures must be translated into meaningful ones. But could anybody have hoped for the rich tone quality delivered by countertenor Tim Mead in the role of the fairy king? The vocal precision demanded by the early-music world also served Anna Christy particularly well as Tytania. One cast-wide observation -- and this was true of the lovers sung by Georgia Jarman, Siena Licht Miller, Brenton Ryan, and Johnathan McCullough -- is that Britten’s musical setting of Shakespeare’s language never felt contrived or cerebral. The Act III play within the play -- it always brings down the house in theatrical productions -- is treated mockingly by Britten. To me, it’s much funnier when the tale of Pyramus and Thisbe is acted as a matter of life and death. The fact that Matthew Rose (Bottom) not only revealed his humanity in Britten’s less-humane circumstances was a major reason why he was the production’s star. Also, this Curtis Institute graduate has one of the most lustrous, unforced bass-baritone voices in the business. And that didn’t hurt one bit. Additional performances of the Opera Philadelphia production: 2:30 p.m. Sunday, Feb. 10; 8 p.m. Friday, Feb. 15; and 2:30 p.m. Sunday, Feb. 17. Tickets: $25-$299. Information: 215-732-8400, operaphila.org.